We have some very talented artists and story tellers in the Top End, and what better way to get the next generation to value our wildlife and landscapes and the connectivity between species, than to intrigue and educate them through books, here is just the first of a few great titles that we will feature.. .
My main aim is providing accessible images and stories for children about native wildlife to entertain and educate. The last couple of books have focused on urban wildlife to provide stories that Top End kids can claim particular affinity with with the hope that in turn this will stimulate interest in other local species. My first book “Quoll” (published by Windy Hollow Books 2008) was inspired by the Island Ark Project, a collaboration between Biodiversity North, The Territory Wildlife Park and The Gumurr Marthakal Rangers aiming to preserve a healthy population of Northern Quoll on offshore islands as the arrival of Cane Toads in Top End was pushing the species to the brink of extinction. The story of one quolls plight is told from the animals point of view as she tries to save her family from the Cane Toad ‘invasion’. The Northern Quoll (Dasyurus hallucatus) is a mammal native to northern Australia which weighs 300g- 1000g and has prominent white spots on its fur. It is carnivorous and eats a range of invertebrates including reptiles. It’s habitat is hollow logs, tree hollows and rock crevices. The Northern Quoll is listed as critically endangered in the Northern Territory and is listed as endangered within Australia as a whole. It has been recorded as rapidly declining in numbers over the last few decades. This decline is largely attributed to the introduction and spread of cane toads but also is affected by frequent and late season burning, which causes habitat loss. In the Northern Territory the quoll is restricted to the Top End. To assist its recovery private landholders can implement a Cane Toad eradication program, prevent the loss of habitat, particularly tree hollows by protecting landscapes from hot fires and even create and place tree hollows with the property. 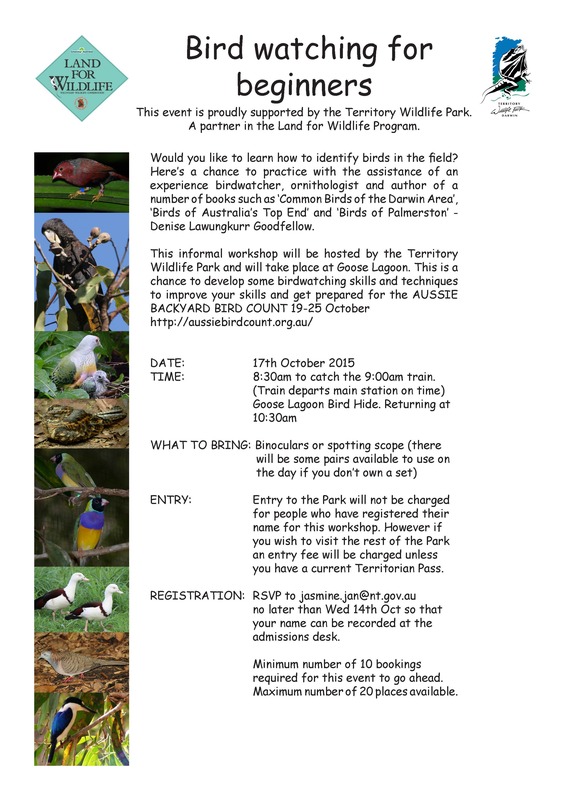 Another fantastic workshop, with a fauna focus was hosted especially for Land for Wildlife members at The Territory Wildlife Park. This workshop focussed on reptiles that are likely to be found in Top End landscapes and particularly properties of the rural Darwin area and how best to manage habitat for their success. Nearly 30 Land for Wildlife members all boarded the train on another slightly sweaty but beautiful Saturday morning to meet Dion Wedd, curator of the collections at Territory Wildlife Park. In the nocturnal house Dion gave us a background to reptiles in the Top End and how we can look after their habitat, as well as all the participants having an opportunity to see and even handle some of the species themselves, including a Blue- tounged lizard (actually a skink), a Frill-necked lizard, a Tree frog and others. There are over 300 species of Lizards, snakes, turtles and frogs that can be found in the landscapes of the Top end region and about 1/3 of those in Darwin and rural region. Lizards include numerous small skinks which are common even in suburban gardens and rummage around in leaf litter, Dragons- Frill-necked Lizards (Chlamydosarus kingii), Tree Dragon (Gowidon temporalis) and Gilbert’s dragon (Lophognathus gilberti) gheckos and goannas, there are also Pygopods, which are legless lizards (and yes they look quite like a snake). In wetter areas we find amphibians (frogs, toads and toadlets) in great numbers, turtles and water monitors. Many Land for Wildlife properties include inundated areas of Sandsheet, treed swamp or freshwater creeks. And snakes, yep there are lots of them, over 40 species in the Top End region, many of the more common ones found in the Darwin region. Unfortunately there is a culture of humans in Australia fearing snakes and wanting to kill them, often without much knowledge of their behaviour or how harmful they are. Generally keeping a distance and letting them be is the best action. We joined Greg Mayo, Wildlife keeper in the monsoon rainforest, who told us a lot of amazing information about snakes, their behaviour and habitat and showed us a live Black-headed python (Aspdithes melancephalus). We were also informed of some snake first aid and who to call if a snake was too near. Australia has 8 of the Top 10 deadliest snakes in the world, but only (on average) one person dies of a snake bite per year and almost always they were bitten when trying to catch it, handle it or had hurt it. Compared to other statics of how people die in Australia, that is pretty low on the list, we should be a lot more worried about cars, other humans and bad food or alcohol! After our talks we had time to enjoy the reptile displays in the rainforest and got together at the main station for brunch and everyone got to share stories and tips on land management for reptiles on their own properties. The biggest threat to reptiles in our region are ‘inappropriate fire regimes’, Cane Toads and possibly at the Top of the list habitat loss (land clearing.) So good land management practice and the efforts of landholders (and our members) is of great importance. “Inappropriate fire” is fire that is too widespread, too regular or too late in the season, or a combination of these factors. Most reptiles find it hard to get away from fire, they will try and find an underground or wet place or move to an unburnt area. If fire is later in the dry season (and enhanced with extra fuel from grassy weeds) it will often kill most lizard (and some mammal) species in the landscape. You will see birds of prey circling overhead ready to eat the grilled animals. IN addition to this, the leaf litter layer, where many smaller species thrive is taken away with fire. On most small rural blocks, keeping fire out of the property with fire breaks and diligence is the best strategy. Keep up the great work and a big Thanks to The Territory Wildlife Park staff for all their time and knowledge. 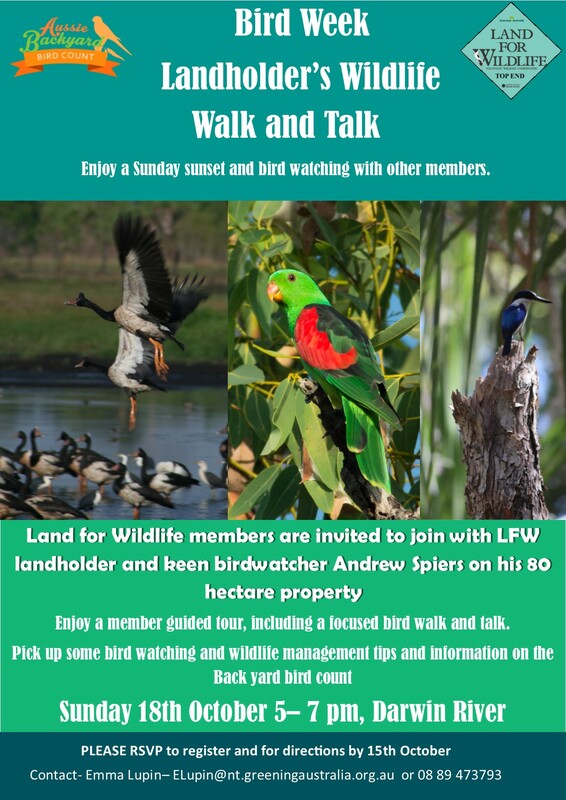 It’s bird week, Land for Wildlife ran some great bird focused events at the weekend and we thought we would share with you some Top End bird profiles during the week and some bird spotting tips. 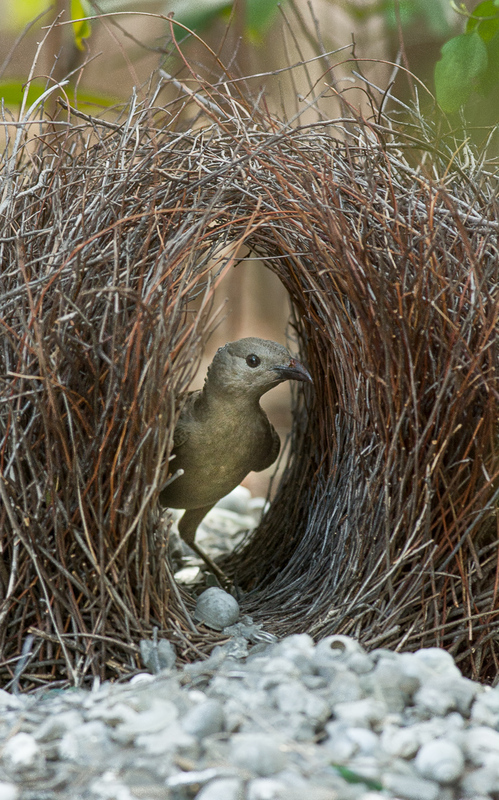 The Bower bird is a curious bird, grey with a brownish grey back, up to 40cm tall. 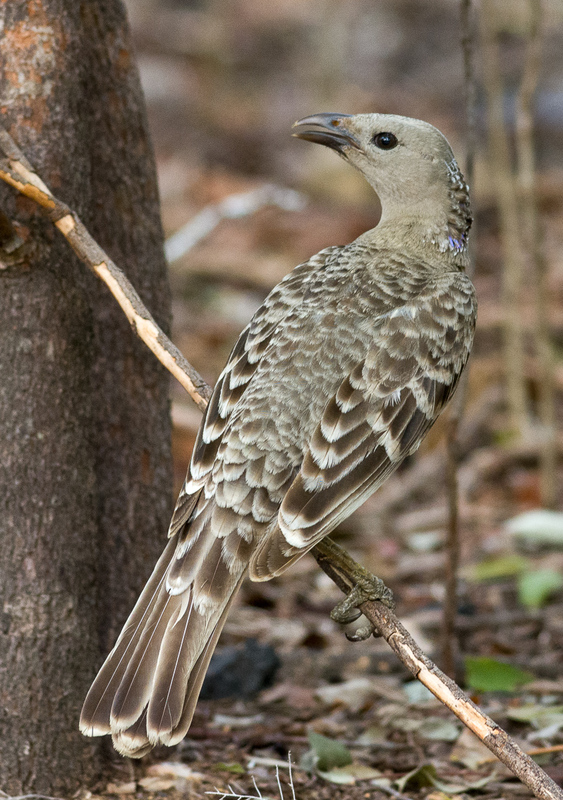 This bird is usually solitary and has a lilac attractive nape crest, which is larger on males. 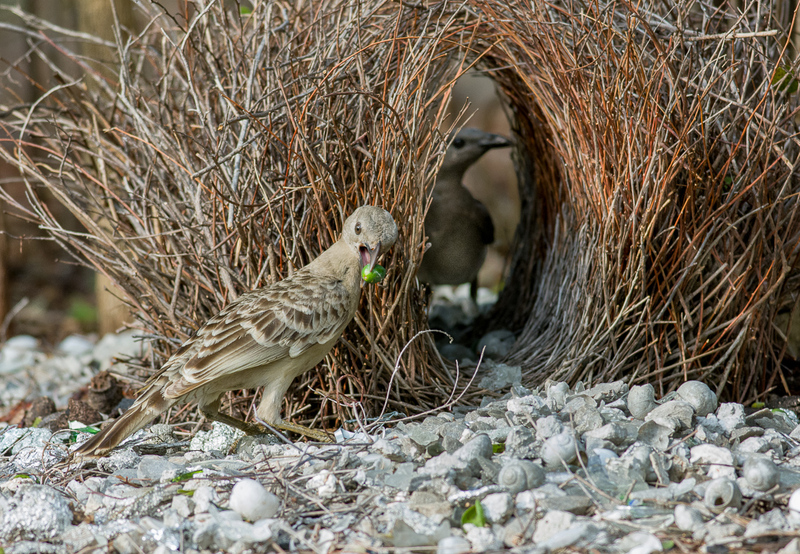 The most distinctive feature of this bird is probably their bower, an open over arched mate magnet of twigs on the ground. These are usually found under low hanging shrubs such as Turkey Bush (Calytrix exstipulata) This is built by the males to attract females and is surrounded by found blue, green or sliver shiny luring objects like white shells, plastic bottle tops, green fruit and broken glass. It is here where the male will display by dancing and opening his tail and hopefully along with the shaking of his funky lilac head piece and shiny entrance ornaments tempt the female to mate with him. The female leaves the nest (more like a love den) after mating and then goes off to build her own nest and raise her young alone. 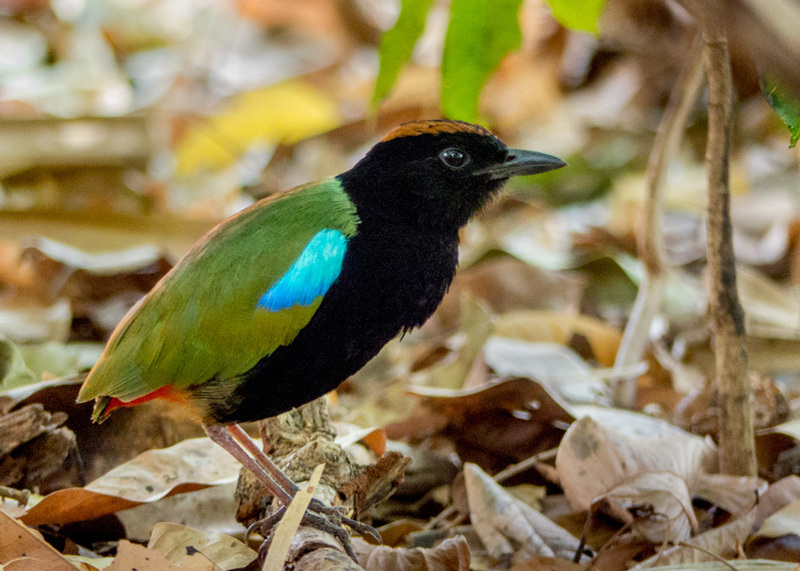 The call of these birds has been described as someone vomiting violently or shredding paper and the birds can mimic sounds and human laughter. 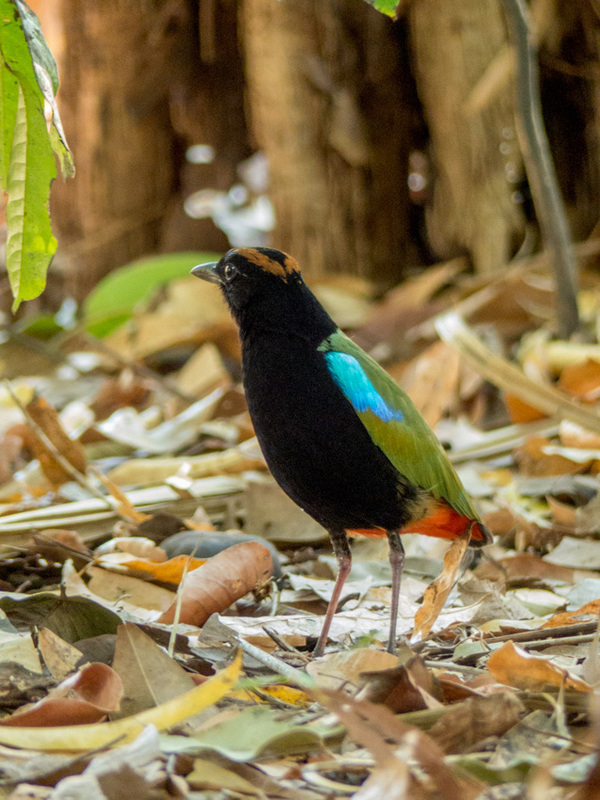 Bower birds are found across northern Australia in open woodland and the edges of mangroves or monsoon forest. Another interesting fact is they are noted to to eat Strychnos fruit (Stychnos lucida) which contains strychnine and are poisonous to other creatures.